On the 24th day of March 2015, a collection gathered for over four decades of exceptional international career diplomat post, was formally turned over. For over a year of planning and meetings, Ambassador Delia D. Albert firmly decided that the De La Salle University Libraries be the permanent home of her valuable collection. Visiting professors and authors, Dr. James Roger Beebe and his Filipina wife, Dr. Maria Africa Beebe donated their books to the DLSU Libraries. They recently served as resource speakers in a research writing workshop organized by College of Liberal Arts last March 16 and 24, 2015.
so donated to the Libraries. at 11:37 AM No comments: Tags: Book Donations. Another session of LiBro, an outreach activity that aims to teach children Lasallian values through conducting fun and educational activities, was held last March 13, 2015 at Bagong Tuluyan Center , Fidel Reyes St., Malate Manila. This activity was conducted in partnership with Center for Social Concern and Action (COSCA) and the officials of Barangay 717. The range of activities prepared for the children revolved around “kindness” especially with our words. Twenty-seven (27) children, ages three years to eight years, had actively participated in this activity. 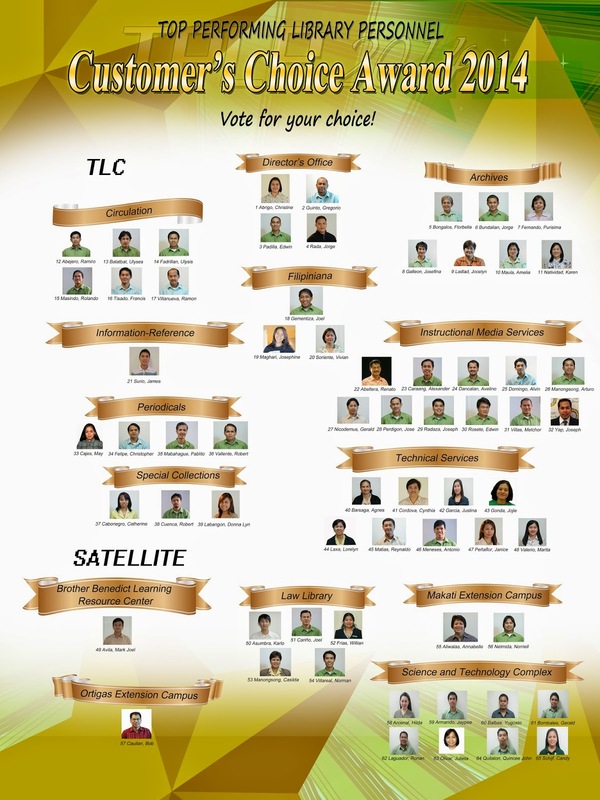 The Libraries' Top Performing Library Personnel (TPLP) Committee is now on its search for the 2014 Library Customers' Choice Awardee. The TPLP is an "annual tradition of the Libraries to recognize its employees that have rendered exemplary service to the academic community". The Customers' Choice Award is a special award given to the personnel who is most liked by the library users based on their online and paper votes. Demonstrates excellence in providing quality library service. Courteous and attentive to the needs of the library users. Delivers the needed information effectively and efficiently. Voting ends on March 19, 2015.